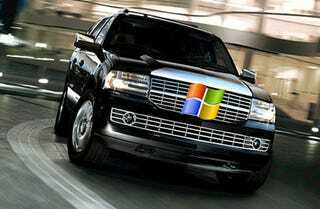 For all those fans of the Microsoft Sync system not willing to strap into a Ford Focus to get it, rejoice and be glad, for now you can get it dealer installed in your new Lincoln Navigator. The announcement came today from the glass house that the luxo-barge will get the hand free all-in-one communication and entertainment system as a kit available for 2008 and forward models. Expect to see soccer moms without cell phone glued to ear but appearing to talk to themselves in no time. DEARBORN, Mich., May 1 — Lincoln Navigator owners wishing they had Ford's industry-exclusive SYNC in-vehicle communications system, need wish no more. Ford has introduced an affordable, dealer-installed SYNC accessory kit that allows select 2008 Navigator and Navigator L customers to enjoy the award-winning voice-activated communications system that works with most Bluetooth-enabled mobile phones and digital media players. Ford first introduced the Microsoft-powered SYNC system on the 2008 Ford Focus. And 11 other 2008MY products soon followed, including the Ford Edge, Taurus, and the Lincoln MKX and Lincoln MKZ. As part of Ford's aggressive migration plan, SYNC will be offered on nearly every 2009MY Ford, Lincoln and Mercury vehicle. "The company's decision to offer the custom SYNC accessory retrofit kit first on Navigator wasn't casual," says Doug White, Vehicle Personalization Marketing & Planning manager, who adds that original migration plans were to add SYNC to the luxury SUV for the 2009 model year. "Customers and dealers were telling us that we needed SYNC on our flagship SUV and we felt we needed to respond to those concerns as quickly as we could," says White. "They essentially said, 'If you have it on Focus, why not Navigator.'" California dealer Ed Witt of Witt Lincoln Mercury expects the SYNC accessory kit to be a big hit with Navigator customers. Witt was one of the first dealers to order up the kits in early April. "This product is done to perfection and works just as if it came from the factory," says Witt, who installed 10 of the SYNC kits just three weeks after it became available. "For standalone Lincoln Mercury dealers, the Navigator is an extremely important product for us - an icon for the Lincoln brand. Having SYNC gives us the opportunity to go back to our Navigator customers and offer them a solid system that is absolutely seamless and works perfectly." For the SYNC retrofit kit, customers must own a 2008 Navigator or Navigator L equipped with the Elite Package that includes the voice-activated navigation radio and rear seat DVD. Vehicles must also be built after December 4, 2007. The accessory kit, which consists of the SYNC module and related hardware, costs under $550 installed. Installation time is under two hours. The system uses the existing steering wheel button controls and voice- activation functionality connected with the navigation system, eliminating the need for an add-on HMI or microphone to operate SYNC. Once installed, the retrofit SYNC system is fully integrated. "The hardware is hidden and the system is totally seamless to the customer," says White. SYNC accessory kits are also under development for other vehicles, including the Ford Mustang.